Welcome to my equipment page. 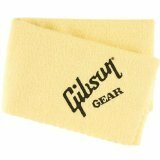 This is a quick rundown of the guitar gear and accessories that I personally use. When friends and family ask me about buying tuners or picks, these are the things I recommend. A lot of this stuff is not expensive, and you may be able to shop around for some cheaper versions. 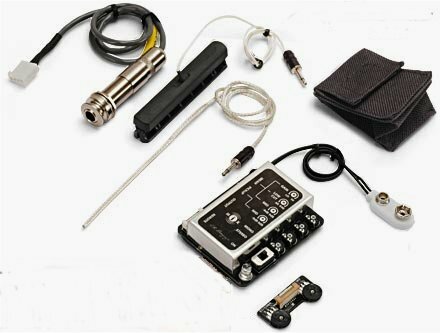 However, if you’re serious about playing guitar, it’s worth investing in a good set of tools. The less you have to worry about the gear, the more you can just have a good time playing. If you are looking to purchase individual items that I mention on this page, I’ll provide a Amazon link in each item’s description. Please know that I do earn a small commission for any Amazon orders purchased within 24 hours of clicking through any of my affiliate links. I appreciate the support of those who purchase through my affiliate links. 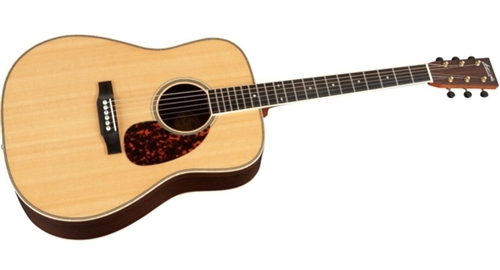 A beautiful, solid guitar with ringing overtones and a big sound. I love this thing. Mahogany neck, Sitka Spruce top, Rosewood back. Craftmanship is excellent, with some tasteful Herringbone inlay around the binding and soundhole. 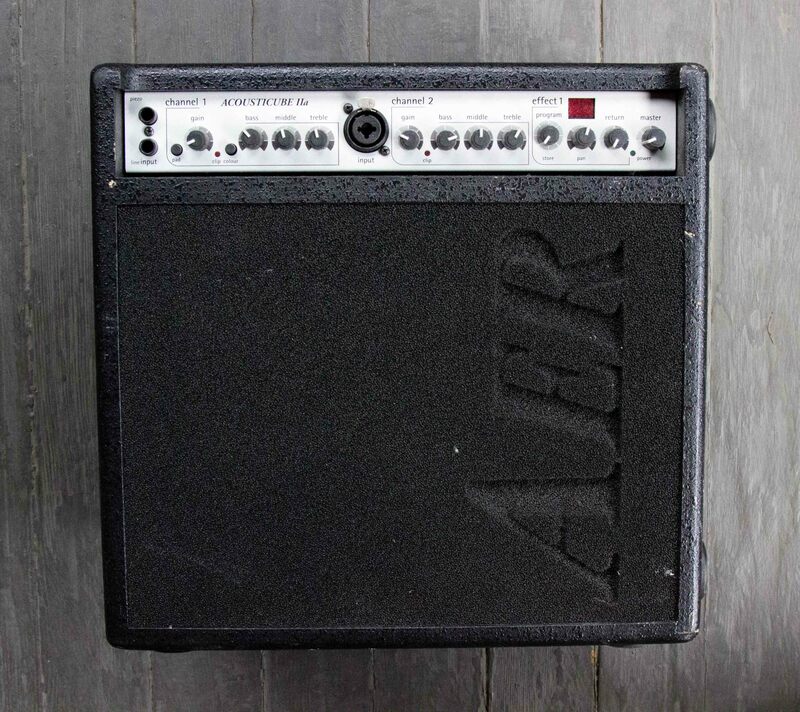 An amazingly powerful and clear little amp. A friend referred me to this a while ago (quite a while ago, now that I think about it…) and I haven’t looked back. 2 channels (1 for guitar, 1 for vocals), built in effects, speaker out, and impressive clarity. Acoustic Electric Research (AER) has discontinued the IIa and is now producing the Acousticube 3. The iMix combines L.R.Baggs iBeam and Element pickups so that you can create a mix between a more natural “woody” sound and the normal piezo pickup sound. Volume and mix knobs are right under the lip of the soundhole, really handy. I’ve installed this on my last several acoustics. I usually turn this pick in my hand so that I’m playing with one of the blunt corners. I talk more about picks here. 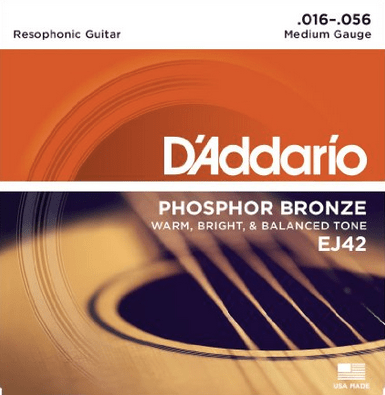 A standard for fingerpicking and dobro. 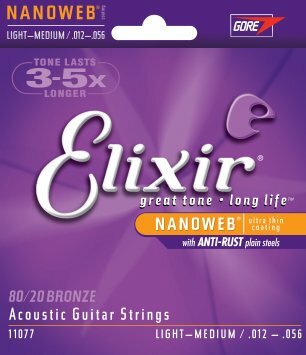 I use these on my Larrivée acoustic guitar. They sound great and last a long time. The friend who gave me my dobro setup used these. They sounded good, so I’ve just kept with them. 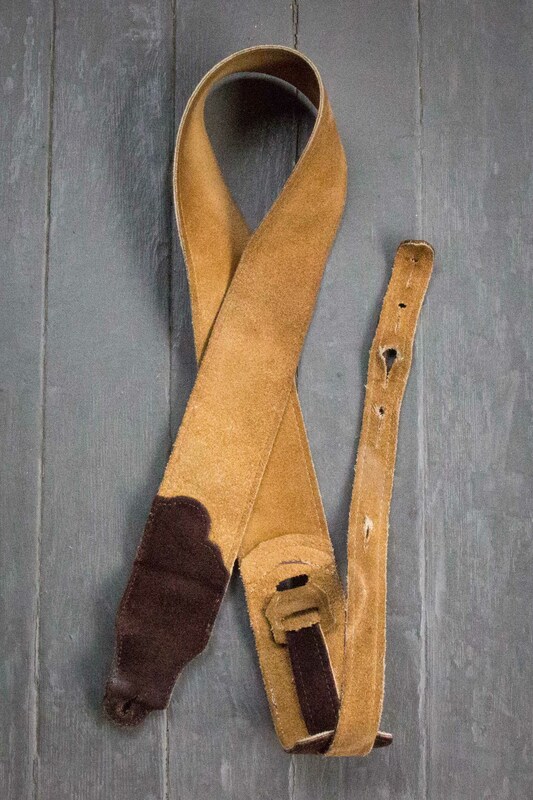 This is a picture of my actual leather guitar strap by Franklin. Double-layered suede, nice and simple. Unfortunately, Franklin seems to have a discontinued it. But it looks they have an updated version. The Snark series of tuners has become the quick, cheap, and popular clip-on tuner recently. But I’m still rockin’ my old Intellitouch. 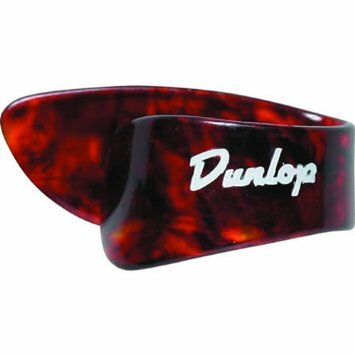 I’ve written more on tuners here. I also use a tuner app on my iPhone quite a bit, more on that here. 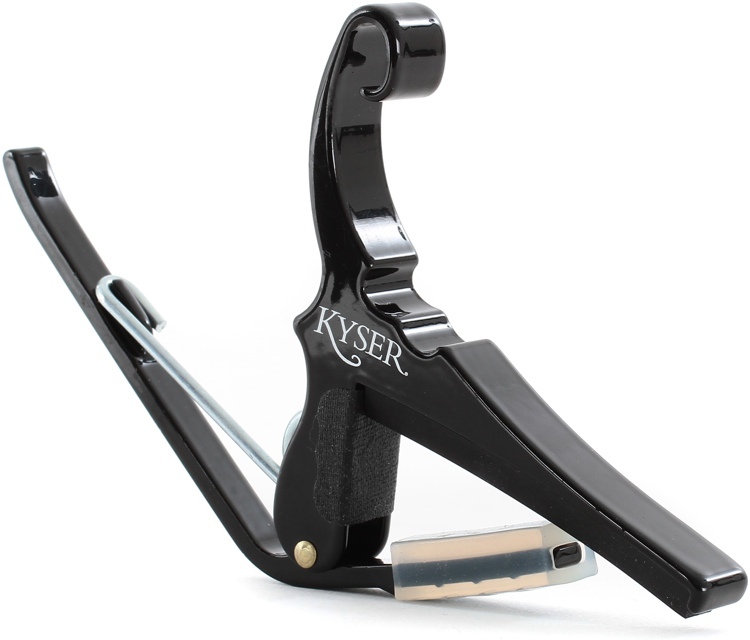 This capo is solid and is easy to quickly move around. I’ve used it quite a bit live, so being easy and dependable have been really important. 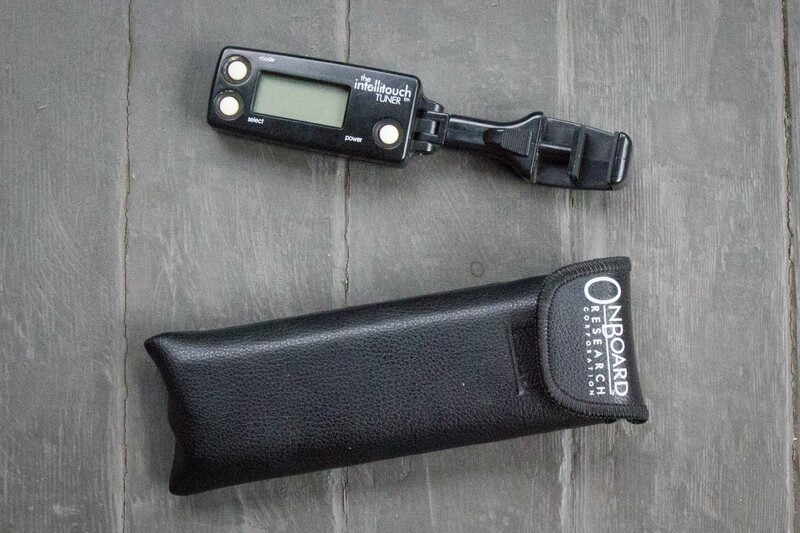 I think I’ve used the same simple guitar tuner tool for over 15 years. Cheap and effective. This doesn’t need to be fancy. The wirecutters from your toolbox, or from a hardware store are perfect. I’ve used a Guardian Cable for a while, but they’re no longer around. I’ve also been happy with the Hosa cables. 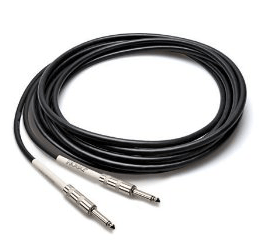 I like at least a 10′ cable so that I have room to move on stage without knocking things over. I simply use a basic polish cloth, no micro-fiber synthetics or anything.